You've seriously all gotta check out DataEast's CarryMap 3.0 application. It includes a 30-day trial. I suppose the extension does something like what TerraGo's GeoPDF extension does. Except CarryMap creates portable .exe's as well as files that can be read on phones with Windows Mobile operating systems, and on iPhones, iPads, and iPod touches. And a single CarryMap license costs about US $161, compared to TerraGo's $2,754 license. I'm pretty sure that CarryMap will go far in allowing us to share our data with - and create virtual atlases for - folks who don't have access to expensive GIS software. The portable maps you create allow for querying, checking distances, turning on and off layers, and the usual. And unlike ArcExplorer or ArcReader, the person you give the portable map to doesn't have to install anything or browse for where the data is because the data's contained within the portable map already. It's worth checking out. 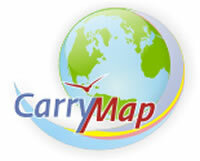 CarryMap needs ArcGIS 9.2/9.3.1/10.0. Thanks Emil - awaiting a map sample; and I'll give the app a try as well.